A hovercar careens wildly, pursued by police robots on the skyways of the year 4000. At the controls is Leeja Clane, and she's fed up. Rich and pretty, daughter to a senator, she will smash her gilded cage and seek a world of adventure. In a moment, she will encounter Magnus, Robot Fighter, a fine specimen of a man. A beef slab of a dude; a hard, well-muscled mass of tough, gristly guy meat! Raised from infancy to battle tyrant robots with his bare hands, Magnus is the hero and Leeja will love him immediately, as she must. It's his comic. 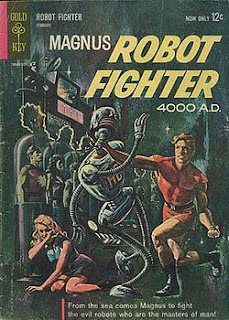 Magnus, Robot Fighter 4000 AD was written and illustrated by Russ Manning beginning in 1963. Manning's claim to fame was his work on the Tarzan comic book, and Magnus is the heir to that concept. Orphaned, raised at the bottom of the sea by kind, noble emotional robot 1A, Magnus is devoted to the cause of freedom. He's pledged to end human sloth and decadence via their servile mechanisms, which have taken every responsibility away from man and with it any semblance of self-determination. It's a fun, bright, earnest comic. Magnus is admirable. But I find Leeja to be the real character to root for. Magnus never questions his mission, or the possible nefarious motives of a robot who would raise (program?) a human to smash robots. Leeja, however, has motives and feelings and other girl stuff. Bored and stifled, she becomes a fugitive for a slight infraction of the posted speed limit, and chooses to stand up to the Pol-Robs. Yeah, OK, she spends the rest of the book mooning over Magnus, but before there was a movement by that name Leeja Clane was a real liberated woman.